Organization with style has never been so easy. This metal hook is designed to hold a wide variety of items coats, hats, handbags, umbrellas, towels or robes. This classic design is perfectly suited for any room from the entryway to the bathroom. The Venetian Bronze Steel Magazine hooks by Gibraltar Mailboxes help add extra storage to accommodate a range of newspapers and magazines. They are easily installed and are designed to fit various wall mount mailboxes. They feature a smooth powder coat finish for added durability. From Liberty Hardware, this decorative architectural single prong hook coordinates with Delta faucets and bath hardware. It's designed to hold a wide variety of items including coats, hats, handbags, umbrellas, towels and robes. It's an inspired way to add a touch of elegant storage where you need it most. The Beveled Square Hook by Liberty gives you exceptional organization in great style. Bold lines offer high fashion while the coat and hat hook design offers incredible functionality. Ideal for any room that needs a little help controlling the clutter. Contempo Pilltop Hook Bronze w/ Copper Highlights Organization with style has never been so easy. This metal hook is designed to hold a wide variety of items coats, hats, handbags, umbrellas, towels or robes. This classic design is perfectly suited for any room from the entryway to the bathroom. 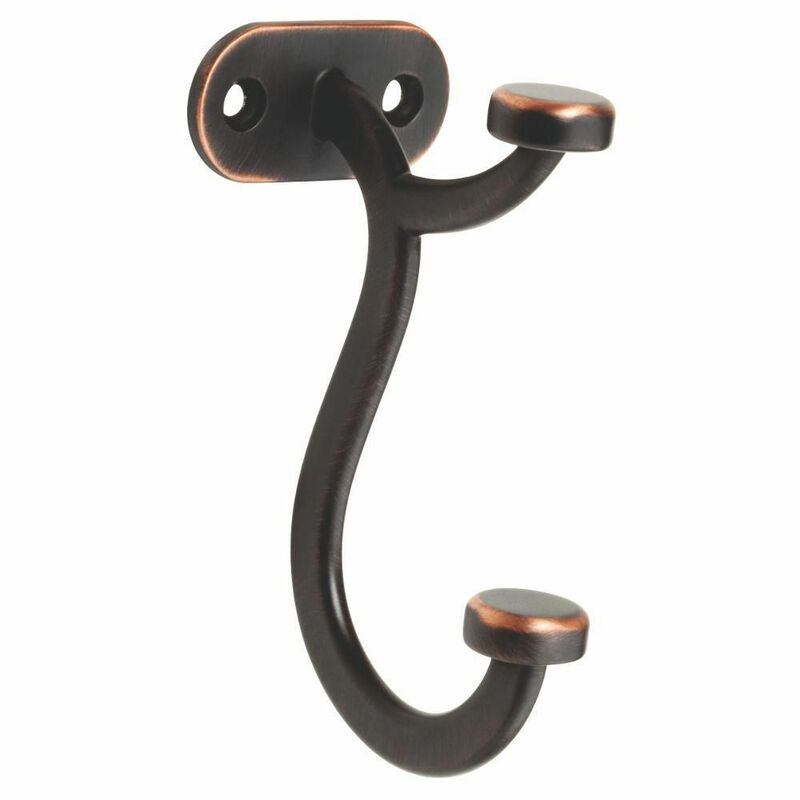 Contempo Pilltop Hook Bronze w/ Copper Highlights is rated 4.3 out of 5 by 6. Rated 1 out of 5 by Hooky from Half the hooks I ordered were bent. I placed another order hoping to get enough straight hooks to... Half the hooks I ordered were bent. I placed another order hoping to get enough straight hooks to do my project. The second order was worse than the first. The hooks are pretty and heavy, but there is definitely a control issue with the manufacturer. Rated 5 out of 5 by Dawn1234 from Gorgeous! Love these hooks! Traditional hooks would not have worked, I needed something that hung down instead of sticking up, and this fit the bill perfectly. Love the copper highlights, I think great value for a durable product. Rated 5 out of 5 by Marc from Perfect coat hooks I recently built this hallway mirror and needed coat hooks for it. I looked all over the web for something that fit both the mirror's style and my home's style and these hooks did the trick. I think they dressed up the mirror very nicely. Rated 5 out of 5 by Customer from Sturdy, decorative, unique hook This hook has a nice looking finish, is sturdy when installed and hangs downward with the pill top on top of the hook so the item hanging is not have a pointed stretched area. The hook looks nice and looks safe as it is not too pointy upward or outward pointing. This is the second time I have ordered the same hook. Rated 5 out of 5 by amateur7 from Beautiful, solid, hooks Not only do these hooks look great, but they solved a problem as well. I had a carpenter build cubbies for our mud room. I made the mistake of leaving it up to him and my husband to come up with the custom dimensions while I was at work. Well, the section made for the for kids' coat hooks was built too high for kids to reach. These hooks provide a significant drop which lowered the height for kids' coats. Not to mention the finish on the hooks is beautiful - a dark bronze with copper highlight. They are made well, nice quality and strong. A bit rustic and cool vintage.